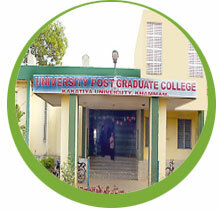 University PG College, Khammam was established in the year 1991 and is offering M.A. English, Economics, M.Com., MBA, MCA, M.Sc. (Computer Science). It has a good collection of more than 2500 books in the library and it subscribes to several research journals. Good accommodation is being provided to the students in the hostels and it has a computer laboratory with INTERNET broad band faciltity.